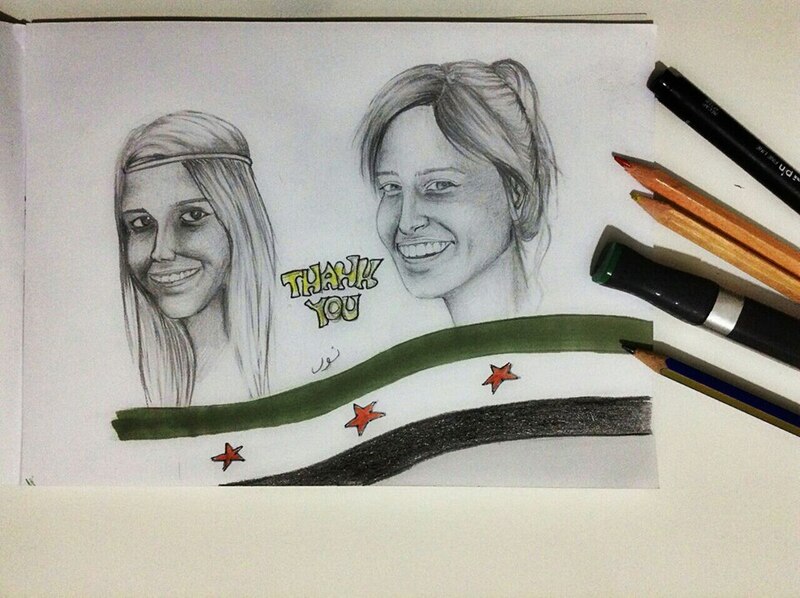 Thank you, from Nour, an artist in Syria. Welcome home. We are very happy to know you are safe within the loving embrace of your families. In these five months we have never stopped praying for you. I want to just write a few lines to thank you for your sacrifice and your commitment, thank you for having made the cause of the long-suffering Syrian people your own and for having taken so fully to heart the suffering of the children, women, youth and the elderly who are dying in Syria. You are a noble example of what volunteering is, the pride and joy of Italy, where every day thousands of persons are dedicated to helping those in need. The Syrian people thank both of you and all the Italians who have never stopped sending their aid and who have welcomed and comforted refugees in transit on Italian soil. You have been mothers to the little orphans and sisters to the many Syrian women who are paying with their lives without any reason for it. You have waved the flag of Free Syria, honouring the sacrifice of the 270 thousand Syrian victims who have died in the name of dignity and freedom. As a father, I am so proud of your altruism and your generosity: so young, and yet at the same time, so sensitive to the pain of the millions of helpless civilians who have been undergoing a genocide for almost four years. My dear daughters, five months spent so far away from your loved ones, five difficult months of pain and suffering: you have paid so dearly for your altruistic instinct for which the entire Syrian population, 21 million persons, are indebted to you. Please don’t apologise, on the contrary: the world of free men and women is on your side and is with you, and is very sorry for all that has happened to you and what you have had to undergo. Welcome back, and may you receive the blessings that the Lord will grant you for your generosity and sensitivity.